The transfer of the Ariane 5 to the launch zone in French Guiana continues to delay the launch activities of Arianespace for Flight VA236, which will — eventually — carry the SGDC and KOREASAT-7 satellites to their orbital slots. 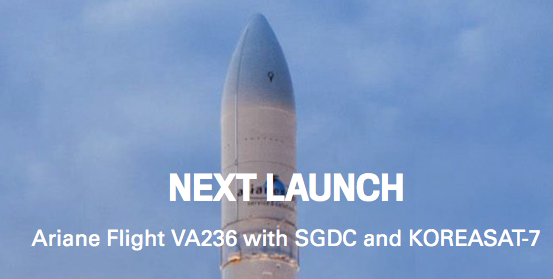 Arianespace Flight VA236 will launch SGDC for Telebras S.A., performed within the framework of a contract with SGDC prime contractor VISIONA Tecnologia Espacial S.A.; and KOREASAT-7 for KTSAT. An interesting situation at Arianespace today that has caused the delay of the transfer of the launch vehicle from the Spaceport’s Final Assembly Building (BAF) to the launch zone. Due to a social movement, it was not possible to carry out today’s scheduled transfer of the launch vehicle from the Spaceport’s Final Assembly Building (BAF) to the launch zone. Officials blamed the postponement on a strike among a segment of the workforce at the Guiana Space Center, which is managed by CNES, the French space agency, with support from the European Space Agency and numerous European contractors. As a result, Arianespace has decided to postpone the transfer by 24 hours, with operations resuming tomorrow, Tuesday, March 21, 2017, if the situation permits. The launch vehicle, as well as its SGDC and KOREASAT-7 satellite payloads, have been placed in a stand-by mode and are being maintained in fully safe conditions. Apparently this isn't the first time that labor issues at the spaceport caused the delay of launches, most recently in 2011 when the operators of radar tracking systems in French Guiana went on strike. The workers striking Monday work for the contractor responsible for rolling out the Ariane 5 launcher to the pad.